WASHINGTON - Because John Bolton is five things U.S. President Donald Trump is not — intelligent, educated, principled, articulate and experienced — and because of Bolton’s West Wing proximity to a president responsive to the most recent thought he has heard emanating from cable television or an employee, Bolton will soon be the second-most dangerous American. On April 9, he will be the first national security adviser who, upon taking up residence down the hall from the Oval Office, will be suggesting that the United States should seriously consider embarking on war crimes. The first two charges against the major Nazi war criminals in the 1946 Nuremberg trials concerned waging aggressive war. 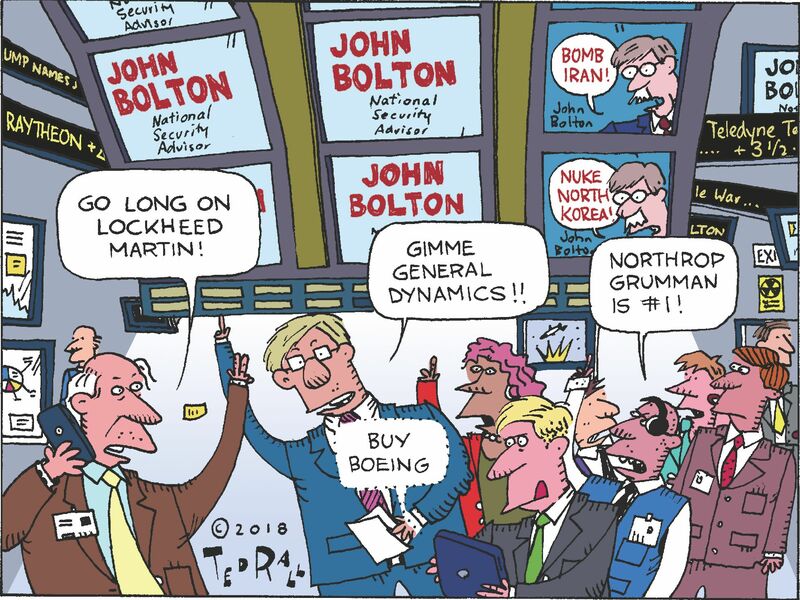 Emboldened by the success, as he still sees it, of America’s Iraq adventure that began 15 years ago last month, Bolton, for whom a trade war with many friends and foes is insufficiently stimulating, favors real wars against North Korea and Iran. Both have odious regimes, but neither can credibly be said to be threatening an imminent attack against America. 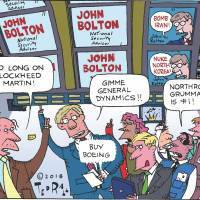 Nevertheless, Bolton thinks bombing both might make the world safer. What could go wrong? It is frequently said that the decision to invade Iraq was the worst U.S. foreign policy decision since Vietnam. Actually, it was worse than Vietnam, and the worst in American history, for two reasons. One is that so far we probably have paid no more than 20 percent of the eventual costs of that decision that enhanced Iran’s ascendency. The other reason is that America gradually waded waist deep into Vietnam without a crossing-the-Rubicon moment — a single clear, dispositive decision. In contrast, the protracted preparation for invading Iraq was deliberative and methodical. It is not true that, as the current president and the virulent left insist, President George W. Bush and his senior advisers “lied” about Iraq possessing weapons of mass destruction. They simply got things wrong, which conservatives, especially, understand was an event not without precedent in the annals of government. Like the Obama administration, whose Iran policy he robustly ridicules, Bolton seems to believe that America has the power to determine who can and cannot acquire nuclear weapons. Pakistan, which had a per capita income of $470 when it acquired nuclear weapons 20 years ago (China’s per capita income was $85.50 when it acquired them in 1964), demonstrated that almost any nation determined to become a nuclear power can do so. Bolton’s belief in the U.S. power to make the world behave and eat its broccoli reflects what has been called “narcissistic policy disorder” — the belief that whatever happens in the world happens because of something the United States did or did not do. This is a recipe for diplomatic delusions and military overreach. Speaking of delusions, one died last month — the belief that this president could be safely cocooned within layers of adult supervision. Bolton’s predecessor, H.R. McMaster, wrote a brilliant book (“Dereliction of Duty”) on the failure of officials, particularly military leaders, who knew better but did not resist the stumble into the Vietnam disaster. McMaster is being replaced because he would have done his duty regarding the impulses of the most dangerous American.